Incident Details: A lady cycling with her family, came off her bike at speed, and damaged her shoulder. The Team were on the scene fairly swiftly, even though shorthanded. 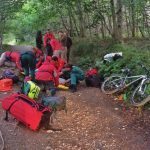 We were able to provide analgesia, and then assisted the ambulance crew to get the lady into a wheelchair. We then pushed her up the bike track to the ambulance. 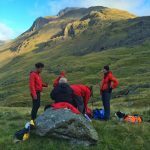 The ambulance crew were assessing her in preparation for transfer to the Cumberland Infirmary for treatment as the Team left to return to base. NOTE – This was the third accident on this section in a fortnight!